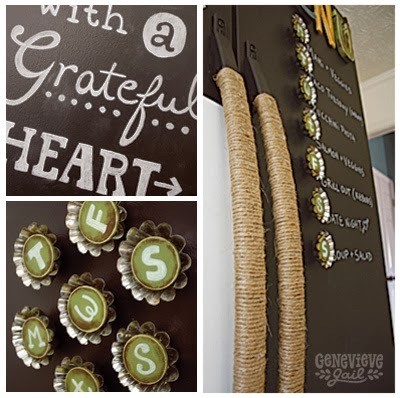 DIY Chalkboard Fridge: I have a 5 year old and I’m doing this in my home!!!! the main things like flooring, painting the walls, etc. and now have moved on to the little details that make our house feel more like our “Home.” The fridge that came with the house works fine, but after painting the walls and kitchen cabinets a fresh coat of a creamy white, the fridge immediately stood out since it was a brighter shade and didn’t quite match. There were also a few dents and part of the plastic handle was missing, but I just couldn’t justify buying a new fridge just because I didn’t like the way that it looked. m-brown-black to match closer to the color I used on the kitchen counters (another DIY that I probably won’t ever attempt again in my lifetime, but that’s another story…). There are about 10 colors on the paint box to choose from, so I picked the brown color and just had them add as many shots of black to it as the can would hold. There are some really fun paint options to choose from though, I think it would be so cool to do this in the pink or green or blue! IMPORTANT UPDATE!!! 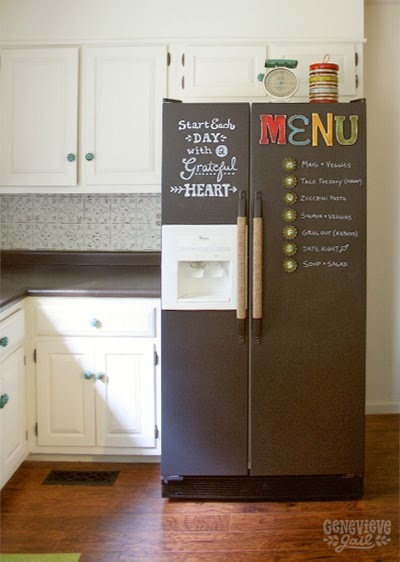 If you leave the chalk pen on the fridge for an extended period of time it will not come off like regular chalk! This is fine for the quote part that I did on the left side because I want that to stay up there, but for the menu part it is back to regular chalk for me… Craft Fail. You live you learn, right? Step 2: Remove the handles and decide what you are going to do with them… I wouldn’t suggest painting them, because after daily use the paint will more than likely rub off (like it has done on the door knobs that I spray painted last year- lesson learned!). You could leave the handles the original fridge color, or mix it up like I did with the wrapped jute. I knew the white was going to be too stark, and I had some jute I’d been hoarding for another project so I decided to try it… freaking LOVE the way it turned out! I simply wrapped the jute all the way around the handle with a little high temp glue gun action on the front and back to hold it in place. When I was done I sprayed a few light coats of Scotch Guard to protect it from dirt and every day wear and tear. I also added the chalk paint to the ends of the handles to blend into the fridge and figured that would be ok since that is not where you grab the handle to open the door. The verdict is out how these handles will hold up down the road, but it didn’t cost me anything to try it so I’m super happy that I did! Step 4: Here comes the fun part… I went to Michael’s (in between dry times) and found some wood letters to create the “Menu” part. Instead of buying all of the same style, I picked letters from different sets to give it more vintage-y feel. I painted the letters with cheapo acrylics and then distressed them with my Dremmel (sandpaper would work just fine too). Then I used the high temp glue gun to attach the magnets to the back. For the “Days of the Week” magnets I painted wood discs and hot glued those to the inside of the tart tins, and then glued magnets to the backs of the tins. If you don’t have access to the tins, you could use smaller wood letters to represent the days, or even just the painted circle discs by themselves would be cute too! I’d rank this project on the easier side of DIY, and I’d say the biggest hurdle is having 5+ hours to spend between dry times, so I’d probably tackle it on a weekend. The other thing I should mention is the vent at the bottom of the fridge could be left as is, or if you want to paint it I would suggest an appliance spray paint. I think it would be pretty difficult to paint the vent with the chalkboard paint, so I just got a basic black appliance spray and put a few light coats on it. Since it’s at the bottom you don’t really notice it, and it doesn’t bother me that it isn’t a 100% match to the fridge color.